It's been a little while since I contributed a blog to our website and while I really wanted to do something ski-related, I couldn't pass up the opportunity to share my recent experiences in San Sebastian with those of you who know my passion for gastronomy and who look forward to my blogs on the subject. While it has been great to visit some of these fabulous places on music tours, we are rarely there for any length of time and there have been many places where I just wished I could have stayed on and immersed myself in the city and of course, in the food culture. 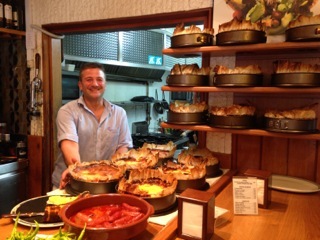 As I mentioned in the first "Confessions of a lunch instructor" blog, San Sebasian has always been one of my favourite places on the touring ciruit and this summer I was able to return for a four-day gastronomic holiday. Officially the world's most delicious city: San Sebastian has two restaurants, Mugaritz and Arzak in this year's World's 50 Best Restaurant awards and more michelin starred restaurants per square mile than London, Paris or Tokyo; you still don't need to break the bank to dine well here. The tapas (or pintxos as they are called in the Basque country) bar scene here is the envy of Spain with dozens of bars and restaurants crammed into the narrow streets of the old town (parte vieja). Knowing that there are only so many restaurants you can try in four days, I'd done my homework, reseaching the pintxos scene thoroughly before arrival in San Sebastian and had narrowed the available meal-times down to be spread among about fifteen restaurants that I really wanted to try. 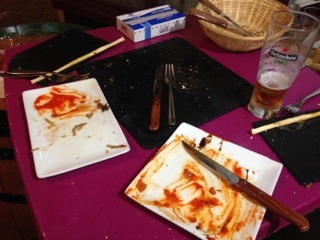 Each place here has it's speciality or signature dish, so it was also quite a challenge to make sure that menus didn't clash when we visited several pintzos bars each mealtime. Cod on an individual smoker in Bar Zeruko. Goiz Argi, Fermin Calbeton Kalea 4. Tiny little bar famed for its skewers of garlic prawns. Txepetza, Calle Pescaderia 5. Anchovies in a myriad of different presentations are the speciality here. Wash them down with some local cider. Gandarias, Calle 31 de Agosto 23. 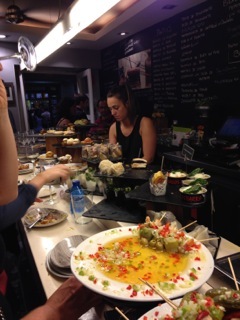 A pintxos bar with adjoining sit-down restaurant. 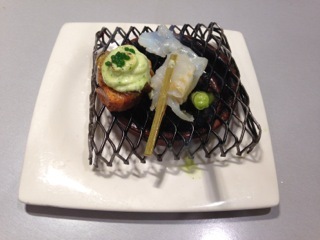 Known for its "solomillo" a pintxo of fillet steak we also found the plate of wild mushrooms (hongos) exceptional. Bar Zeruko, Calle Pescaderia, 10. Probably the most experimental of all the pintxos bars. Molecular gastonomy is the theme here. Fantastic array of pintxos on the counter too but the more interesting dishes are advertised on a whiteboard and cooked to order. Bar Astelena, Calle Inigo 1, Bustling bar on the edge of a large square (Plaza Constitucion). 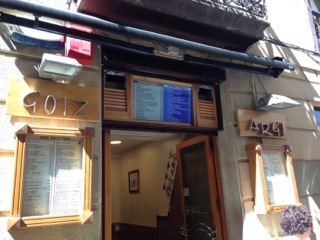 The pintxos menu is on a blackboard behind the bar and everything is cooked to order. 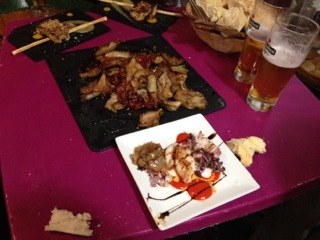 The pintxos of foie (duck liver) and chipperones (cuttlefish) were amazing. Bodegon Alejandro, Calle Fermin Calbeton 4. This is a sit-down restaurant with a michelin star. Had the tasting menu here for lunch. Unbelievable value for such a high standard of cuisine and a very reasonable wine list too. La Cuchara de San Telmo, Calle 31 de Agosto 28. Contemporary cuisine where you either order from the menu behind the bar and eat standing up, or else wait for one of the tables outside and order from the waiter. La Vina, Calle 31 de Agosto 3. A traditional pinxtos bar famed for its cheesecake. Perhaps a good place to aim for to finish off an evening's preabulatory eating odyssey. San Sebastian is visually appetising too. Its beaches are easily the prettiest of any European City. The vast horseshoe-shaped La Concha beach sits adjacent to the old town and on the other side of the Urumea river, and just beyond the modern concert hall, you'll find the Zurriola beach. San Sebastian sits nestled in its surrounding hills and a cablecar takes you up the 1,400 foot climb of the Monte Igueldo on the western edge of the Concha beach. 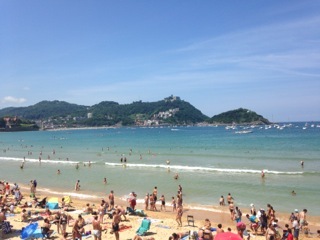 It's no wonder that San Sebastian has been the favoured summer destination of the Spanish royal family for over a hundred years. This is a city that really does have it all; a veritable heaven on earth. I'm already planning another trip for next year. If you've enjoyed this blog, please do leave a comment and I promise; i really will do a ski-related blog for next time.